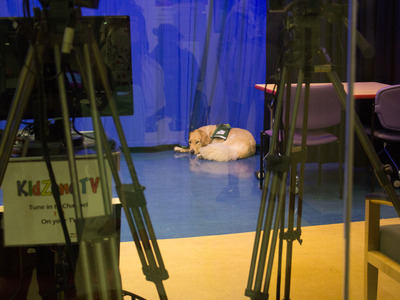 Professor is more than just a therapy dog. In fact, in the 1.5 years he’s been working at Mount Sinai’s Kravis Children’s hospital, he has become a VIP employee. Professor, whose full name is Professor Bunsen Honeydew, is a 3-year-old golden doodle and the first of the two facility dogs to arrive at Kravis. 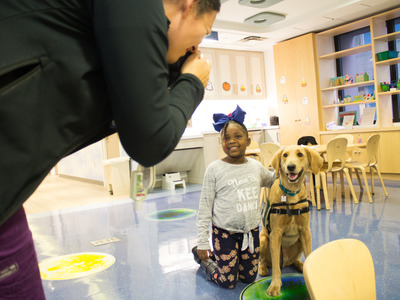 A three year grant of $US350,000 from PetSmart Charities covers everything from veterinary care, grooming, food, trainers, Ubers, and the salary of the certified child life specialist he’s paired with. Shortly after he arrived in March 2017, the hospital realised that one dog wasn’t going to be enough. So they procured Amos, another golden doodle, shortly afterwards. 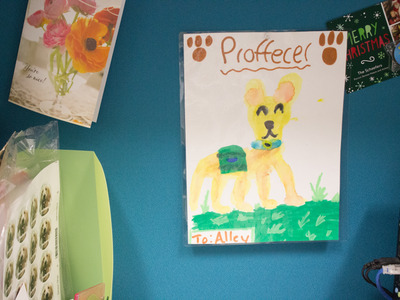 They’re both part of the Paws and Play program in Karvis’ Child Life and Creative Arts Therapy Department. The main goal of child life is to facilitate psychosocial adjustment to hospitalisation and illness. Kravis employs specialists in the ER, clinic, radiology wing, and inpatient units-which includes an intensive care unit. The specialists engage patients and their families in a variety of therapies and stress-reducing activities to decrease trauma and pain, and increase coping. 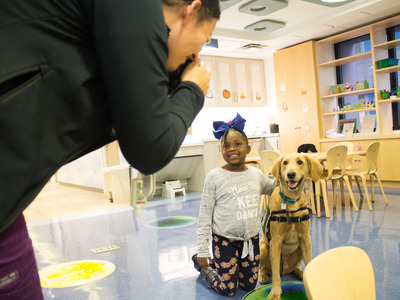 The largest children’s hospitals have been creating facility dog programs for the past 10 years, and Kravis was the first hospital in the New York metropolitan area to adopt this, according to Morgan Stojanowski, assistant director of the Child Life and Creative Arts Therapy Department. 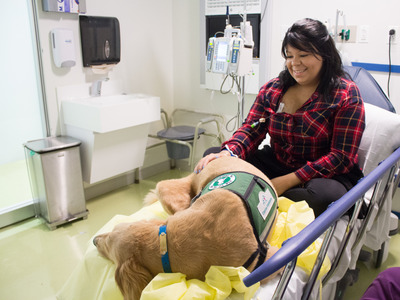 Before the golden doodle duo arrived at Mount Sinai, there was a pet assisted therapy program in place. 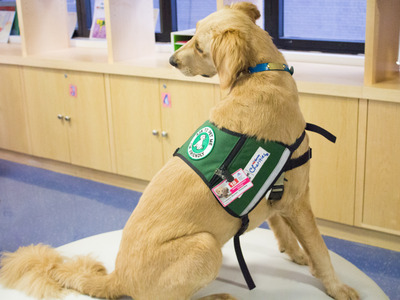 It serves as a completely separate program from the facility dog program and is run through the volunteer department at Mount Sinai. 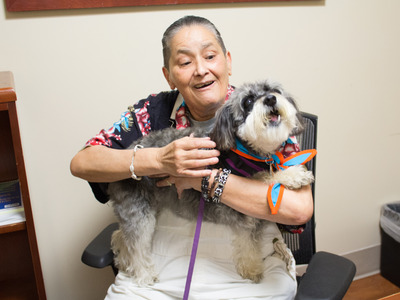 Charlotte Hu/Business Insider65-year-old patient Yolanda Fajardo holds Leia, a volunteer therapy dog, while waiting for treatment at Mount Sinai’s Union Square location. Richard Schack, 65, has volunteered with his schnoodle Leia at Mount Sinai’s Union Square location for over 8 years. 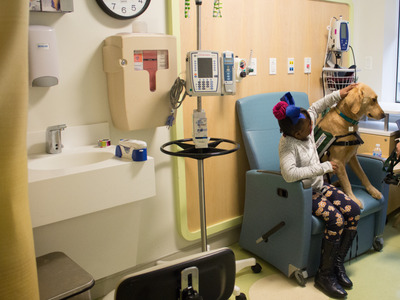 He was part of a study funded by Pfizer Animal Health in 2015 that showed the positive effects therapy dogs had on patients’ emotional and social well being. Leia is certified and insured by the Good Dog Foundation, and to ensure that she’s clean and safe for patients, she gets a bath the night before visiting the hospital. Schack and Leia visit every Wednesday for a couple of hours, during which they make rounds in the radiology waiting room, chemotherapy suite, and administrative staff offices. During these years, Leia has become a fabric of the staff, and her presence has made such an impact that some patients have changed their treatment schedules just so they can see her, said Alison Snow, assistant director of cancer supportive services at Mount Sinai Union Square. Mount Sinai has their own health clearance and screening process, and volunteering is a huge commitment that don’t always fit with most schedules. 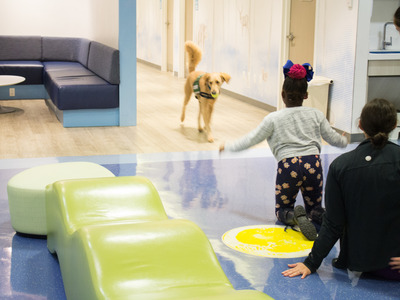 The facility dog program was instated as a way to create more consistency and cohesion, especially with younger patients, so the benefits of interacting with them could be maximized. 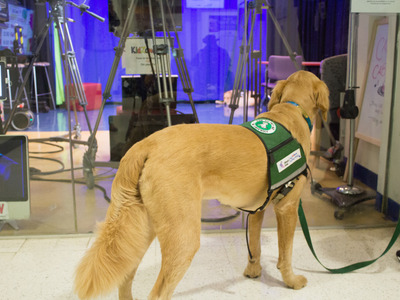 Unlike volunteer therapy dogs, facility dogs are workers first, pets second. Facility dogs like Professor and Amos are embedded into personalised treatment and recovery plans for patients and families at Kravis. All the doctors at Kravis carry with them a referral card for the services of Professor and Amos. They can provide procedural support, comfort and pain management, encouragement to walk, play opportunities, and family support. 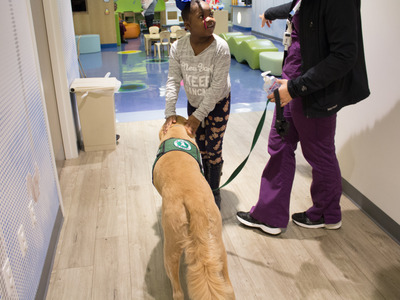 A child-life specialist assesses the needs of the patient, the caregiver and the family, and designs a concrete clinical intervention with the facility dog to meet that need. 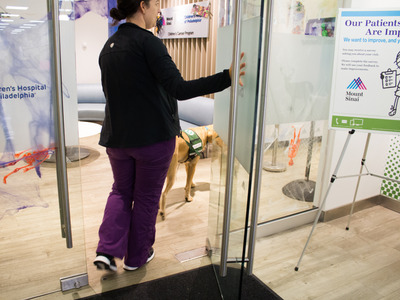 The dogs can encourage patients get out of bed or to walk on their own in order to be safely discharged from the hospital. They also create a relaxing environment for patients to process and discuss their experiences. It’s about making hard, challenging things feel more doable, said Stojanowski. There’s also a syringe with coloured water, and the kids pretend it’s medicine for the dogs. They will give the dogs their ‘medicine’ and that will help them take their own medicine. The dogs also know simpler tricks like high five, take a bow, and ‘chill’, where they lay on their side. These are all humanising things that for a child who has been depressed and disempowered by trauma and illness, said Rode. Small things like this can really relocate a position of control and power for them. The dogs have also been trained practically to respond to quick signals like getting off the bed in the event of a medical emergency. Professor loves Mondays. He mainly works in the outpatient hematology and oncology clinic. 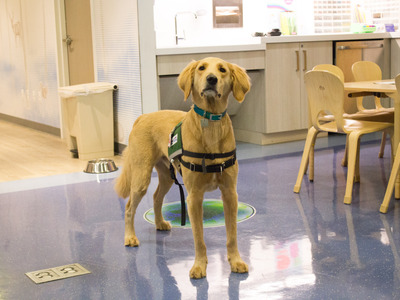 Child life specialist Ali Spike is his primary handler, and he goes home with her after work. Charlotte Hu/Business InsiderProfessor passing by the department’s TV studio on his way up to the hematology suite. He works on Spike’s schedule, from Monday to Friday, 9-5, with nap breaks throughout the day. One hour a day, from 2-3pm, Professor goes with his secondary handler to visit patients at the pediatric intensive care unit (PICU). On Mondays, Professor also attends the pediatric medical rounds from 1-2pm. He’s also a part of certain physical therapy routines, so he does a lot of inpatient support too, including end-of-life support for patients who were close with him. Professor sees between 8-12 patients a day, and sometimes as much as 15-16 patients when there’s a special event. Monday, Wednesday and Friday are usually oncology days, which are more active since he visits a lot of patients undergoing chemotherapy then. Fridays are fancy, so he wears a bow tie to work. Tuesday and Thursday are usually hematology days, and Professor does a lot of lying in bed with patients to help with pain management during blood draws and other procedures. Then, he’ll stay with them until the pain medications kick in. Amos, whose shift starts later than Professor’s, works primarily in inpatient units. His hours are 10am to 6pm everyday. Charlotte Hu/Business InsiderAmos trying to catch some sleep before his shift begins. Amos lives with one of the department’s TV producers, and gets handed off to a child life specialist after getting to the hospital. These dogs have very high visibility, and get a lot of requests, said Rode. But due to funding, the department usually only agrees to attend events in the pediatrics department. In special cases, the dogs will visit and support children whose parents have been in serious injuries or have had a traumatic experience. The department is currently working on a proposal for a third dog, in hopes of cushioning the overwhelming flood of requests from all over the hospital. They would like to use the new dog to manage staff, physician and nurse wellness. Before entering the hematology outpatient suite, Professor gets wiped down. Spike carries hand sanitizer with her and gives it to people before she lets them pet Professor in an effort to stop the transmission of germs to immunocompromised patients. Charlotte Hu/Business InsiderAli Spike and Professor entering the hematology suite at Kravis. “Professor’s up to date with all of his flu shots, it keeps track on his badge,” she said. Dogs need canine flu shots more often and it’s different than flu shots for humans. A lot of viruses and bacteria are not transferrable from dogs to humans, only from dogs to dogs or from humans to humans. Safety is a priority on every level. Playrooms in the space are cleaned every single day, and the dogs are bathed and groomed weekly by a mobile groomer. The department has very specific processes and procedures that they have worked through with infection control and unit management in the healthcare environment, whether it’s in the clinic or the inpatient unit. Zakyra Williams, 7, comes with her mum Andrea every week to do a white blood cell count check. Her whole face lit up as she saw Professor sauntering down the hall, and she immediately rushed to greet him. Charlotte Hu/Business Insider7-year-old Zakyra Williams petting Professor. Zakyra started therapy in July at Kravis. Her treatment plan is inpatient for once a month, and outpatient every 10 days. She has ALL, a type of acute leukemia, and is currently in remission. For her illness and this kind of treatment plan, she has a compromised immune system and can’t attend school. It’s why it’s so important to her that she feels warm and social when she comes in for visits, it’s something that she really needs, Spike said. Today morning, Zakyra is the one of the only patients in the playroom, so Spike let Professor off the leash so he can play fetch with her. Charlotte Hu/Business InsiderZakyra playing fetch with Professor. Usually, Professor is always on leash and Spike is cautious when there are new patients or she sense that people aren’t responsive to him or are nervous in his presence. Professor has a bed in Spike’s office, which sits behind a room with a closable door. Whenever Spike senses tension in the playroom, she takes him inside. But most patients, and the staff, love him. “We have a baby that just started walking, and now she chases Professor around everywhere and squeals with joy whenever she sees him,” Spike said. Zakyra helped Professor practice a new trick-roll over-and gave him some water after playing fetch. Patients like Zakyra are always being taken care of and looked after, said Spike, and it feels nice for them to be able to take a break from that routine and care for Professor for a change. Zakyra is getting her flu shot today, and Professor is sitting with her to help distract her from the pain. Charlotte Hu/Business InsiderProfessor sits with Zakyra while waiting for the nurse. 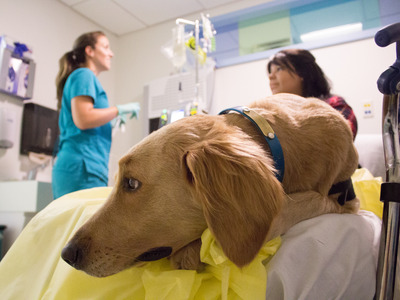 Mount Sinai is about to kick off a study that will look at the effect that the facility dog and child life specialist has on distress during a certain procedures like blood draw, IV line insertion, port access – which is the way patients might receive chemotherapy in some instances. Using a face pain scale, the hospital is going to study whether Spike and Professor can curb the perception of pain and make it seem more manageable. 12-year-old Japheth Martinez-Alvarez comes in for cancer care fairly frequently. He’s built up a close bond with Professor and occasionally teases him by fake throwing the ball. Charlotte Hu/Business Insider12-year-old Japheth Martinez-Alvarez playing with Professor. Normally, Japheth and Zakyra would not interact, but because of Professor, they’re chatting and playing together. 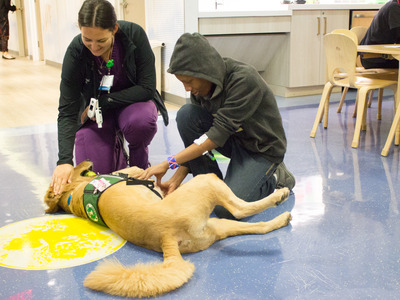 The dogs let the children interact with each other, with specialists and with the caregiver community. They help patients form familiar networks and help the staff bond with patients. “He’s my secret weapon to get patients out into the playroom,” said Spike. As Zakyra finished her checkup and got ready to leave, Spike took a Polaroid picture of her and Professor. After enduring something distressing like getting shots or getting blood drawn, Spike has found that waiting for a Polaroid picture to develop usually take childrens’ minds off the pain they’re experiencing. Charlotte Hu/Business InsiderAli Spike takes a Polaroid photo of Zakyra and Professor. After she was packed, she said, “come on Professor,” and tried to pull him towards the exit. Her mum then told her that Professor’s not going home with them, though she jokingly said that she wished there was a dog like Professor that she could have at home to keep Zakyra comfortable. On days when patients aren’t seeing Professor, they get video messages from him and can write letters to him. Spike and the other child specialists and caregivers try to find new ways to help patients be more engaged. Charlotte Hu/Business InsiderA patient’s rendering of Professor that’s hung in Ali Spike’s office. For the week of Halloween, Spike will be dressing Professor up in a new costume every day, and the kids will be able to decorate mini plush versions of Professor and make costumes as part of their arts and crafts therapy. This is to encourage patients to come in to the playroom and participate in festivities that will promote more socialisation within the community at Kravis. Strong social and emotional support networks can be beneficial to physical health outcomes. “Sometimes Professor knows who needs him before I do,” Spike said. Spike recounts many instances where they will be walking down a hallway, and he’ll approach a doctor or a patient or a parent, and they will tell her that interacting with him made their day. Sometimes she can guide him into a room full of patients, and he’ll selectively go around or go up to a specific patient, and they will tell her that they really needed it at that moment. Dogs’ heightened form of empathy make them the ideal tool for neutralising intense feelings of sadness, anger, and pain, even if patients aren’t displaying it openly. Merceda Devoe, 29, is a special case. She has a pediatric type of cancer called rhabdomyosarcoma, so instead of being placed with adult cancer patients, she’s treated in the pediatric wing. Charlotte Hu/Business InsiderMerceda Devoe, 29, playing with Professor. She’s staying in a room with a stretcher, usually intended for patients who want to rest or sleep, have a longer stay, or want isolation. She’s one of Ali’s priorities, since she relies much more on Professor for therapeutic needs. For her, therapies like art and music that are often offered to the younger children is not something she’s as receptive to. “One thing that we’ve really seen come out of Paws and Play is how much the staff depend on Professor and Amos,” said Stojanowski. To respond to this, the child life team also worked to establish some structured times with the staff, emergency department, physicians, and nurses in ICU. It has a significant impact on their work health to have time with the dogs, said Stojanowski. Sometimes Professor will stand up on a bed, or give Spike other cues that he’s tired, and she’ll lead him to her office so he can take a nap. “They absorb a lot while they’re here, and we’re very mindful of their limits and their stress levels,” said Spike. Dogs can burn out too, and the team wants to be sensitive to their mental health so they don’t. To combat this, the dogs work with a trainer who gives them games to play, and ideas for activities they can do during their time off to de-stress and release tension. On his off-days, you’ll find Professor in the park, running through leaves and chasing squirrels.